Volunteer work and part-time jobs are just a few ways students can develop transferable skills employers seek. Am I qualified? Do I have related experience? How do I stand out? When applying for jobs, students may be asking themselves these questions. What exactly are employers looking for in a perfect candidate? According to the National Association of Colleges and Employers (NACE), recruiters today are looking for evidence of transferable skills. College students do not have to wait for their first job to begin acquiring these skills. In fact, students can learn these skills both inside and outside the classroom. While in the classroom, research by the Association of American Colleges and Universities discovered that 74 percent of employers believe that a solid liberal arts education is the best way for students to prepare for the workforce and the global economy. “Employers can train people for specific aspects of a job, but they depend on universities to foster transferable skills, such as written and oral communication, critical thinking, and intercultural competency,” Associate Professor of History Anthony Crubaugh said. Students can also develop transferable skills outside of the classroom through involvement in Registered Student Organizations, volunteer work, part-time jobs, and internships. “Once you learn these skills in the classroom, it’s extremely beneficial to apply those skills to the workforce. Any hands-on experience working under a supervisor will be valuable to your professional development,” Career Center Career Ambassador Logan Ingersoll said. During these experiences, students will learn valuable skills that can be directly transferred into any career path, regardless of major. In addition, it’s important that students effectively communicate their transferable skills when applying for positions. 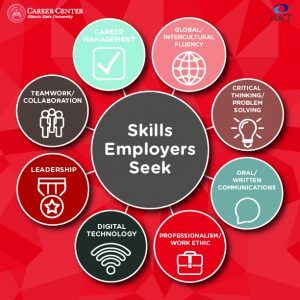 This article is part of a series of monthly articles from the Career Center about transferable skills and is part of its mission to assist Redbirds with developing, evaluating and/or implementing career, education and employment decisions. It also supports Illinois State University’s Educate ● Connect ● Elevate strategic plan. Glad you found this article helpful. It is the first in our series of articles about the transferable skills employers seek in candidates. Be sure to check-out the second article in this series published this month called, "Career ambassador reflects on the value of teamwork to career success." The student who authored it writes about how valuable he found the skill to be in his career experiences.